There’s no shortage of theories connecting Judaism and Harry Potter. Entire books have been written on Potter philosophy and Torah wisdom (see Moment’s interview with Dov Krulwich), and some commentators have posited that its magicians—chosen people misunderstood by others—are essentially Jewish. Yet, others also a postulate a rather unfortunate perspective that J.K. Rowling and her Harry Potter series are guilty of perpetuating an anti-Semitic slur: underhandedly equating the book’s loathsome goblins with Jews. The goblin-as-Jew allegation deserves assessment, partly because anti-Semitism is so serious, but also because if the complaint is true, millions of Jews, including yours truly, could not continue to happily reread and rewatch one of the greatest stories ever told. The goblins, especially as depicted in the movies, are universally hooked nosed, short, unattractive, and green. …Professor Binns’ soporific History of Magic lectures tell tales of centuries of goblin oppression, segregation, mistrust, bad relations, exclusion, and revolts. Sound like any European ethnic minority you know? 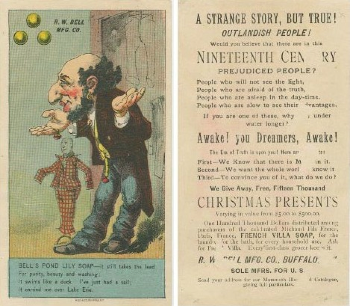 That’s right, Rowlings’ depiction of goblins reflects the type of stereotypes that are more fitting for Russia in the late 19th century or a second rate Gazan newspaper. Once the goblin-Jew connection is made, it’s easy to prove a dislike for Jews. After all, Rowling’s distaste for goblins is quite evident. Rubeus Hagrid – a character inclined to see the good in all people and creatures – warns Harry about goblins in the first 100 pages of the seven book series: “They’re goblins Harry. Clever as they come, goblins, but not the most friendly of beasts.” Deathly Hallows portrays goblins as impassionate neutrals in a fundamentally moral war who ironically play something of a Switzerland banking for the Nazis (Gringotts goblins). In Goblet of Fire, goblins are more concerned with their money than the terrorization of innocents (World Cup Dark Mark raid). And, as judged by the only goblin we really get to know in detail – Griphook – goblins are untrustworthy. This line of reasoning seems compelling, but to foist it on Rowling and the Potter series seems unjust. For one, Rowling does a great deal of borrowing in her stories. She followed established conventions, endowing her dragons with fiery breath and wings, giving her trolls dim wit and powerful clubs, and her goblins with short stature, hooked noses, and greedy manipulation—archetypes that existed well before Rowling ever put pen to paper. Perhaps Rowling drew her goblin based on the goblins in the Nineteenth Century poem “Goblin Market,” in which goblins lure and trick with “evil gifts.” Or consider JRR Tolkein’s goblin—“A foul creature…slightly smaller, sometimes hunched over or appearing to walk and run with limps.” Or just look up goblin in the dictionary and you find a definition that largely resembles Rowling’s creatures. Perhaps the goblin character has its origins in anti-Semitism, but Rowling can hardly be convicted of unjust commentary for using a now-familiar Western literary character. Additionally, the debate over whether the goblin character has its roots in anti-Semitism is wholly unaligned with Rowling’s professed views on Jews. In 2004, Rowling visited a Holocaust Museum and compared the hated “mudblood” and “half-blood” terms used in Harry Potter with the anti-Semitic propaganda of the Nazis: “If you think this is far-fetched, look at some of the real charts the Nazis used to show what constituted Aryan or Jewish blood.” Rowling has also gone on record saying that her evil character—Lord Voldemort—is modeled in part off of Hitler. Both comments won her comments of praise from Jewish organizations. Then there are the movies—in which Rowling played an active oversight roll. The actor that plays Harry Potter, Daniel Radcliffe has a Jewish mother, and the film company that produces the movies, Warner Brothers, owes its start to Hirsz, Abraham, Szmul, and Itzhak Wonskolaser (later changed to Warner). In the eyes of this aspiring Gryffindor, we Jews can enjoy—without misgiving—the latest, and final, Harry Potter movie. First of all, I don’t think J.K Rowling is an anti-semite and I never said so. She clearly has a very strong belief in egalitarianism and racial and ethinc equality. I think that, as you point out, she borrows a lot of tropes and stock figures from fantasy fiction and Victorian novels. But the point with the goblins is not (just) that they have extremely exaggerated versions of stereotypically Jewish features, but that they’re also portrayed as wealthy, greedy, untrustworthy, powerful creatures who control the banking system of the wizarding world. Once again, they are the wizarding worlds bankers. This is the key distinction between Rowling’s fictional universe and the one of Tolkien or Rosetti; and once you notice it, it’s impossible to ignore. Do you think the God of Israel is anti-Semitic? In Exodus 32 He wanted to wipe the Israelites off the face of the earth. Jews go on about the longest hatred etc, etc, but the fact remains, the YHWH the God of Israel DID want to wipe them off the face of the earth & has been killing them ever since. The Bible clearly shows this from the very start & there is more coming down the road. There is nothing better than a godly Jew, but there is nothing worse than an ungodly one! Read the Bible & you will see. Bob Hope = Dumbass. You disgrace his name. It’s not just the Goblin thing, though I couldn’t help imagine the poor poor palestinians as the dangerous, yet sympathetic dragon being kept prisoner down in the vaults at Gringotts in the final movie, finally to be freed from the evil bank run by the Jews, oops, I mean goblins. (Pardon the run-on sentence.) Salazar is a Jewish name; her description of Snape, I believe in the first book, describes his large hook nose and greasy black hair – and let’s be clear, people don’t associate those adjectives with Italians. I’m watching it right now and trying to do an applied I-cord with a blanket, so I’m off, but me thinks me not doth protest too much. It is true that the anti-semitic archetypical goblin in Tolkein, Wagner’s Ring cycle and the “Goblin Market” existed before she wrote Harry Potter. But Rowling was certainly aware of the history of anti-semitism in Europe. She didn’t have to include these characters in her books, and it was a poor choice to do so. I’ve been thinking about this…Maybe in HP universe it’s the other way round: goblins have inspired the jewish stereotype in the Muggle world. Muggles, since they were unaware that goblin existed for real, simply associated that race with jews (not to far off from what happened in real life, by the way: the “greedy dwarf” stock character was associated with jews long after it was invented). Also, I didn’t know Salazar was a Jewish name, but I know that it is a Spanish and Portoguese common last name, and it was likely taken from Antonio Oliveira de Salazar, the Portoguese dictactor who ruled the country from 1932 to 1968, And I’d like to add that many Italians do have hooked nose and greasy hair! The main difference between HP goblins and Jews is that Jews didn’t spend centuries fighting bitter, bloody wars with non-Jews in Europe. J.K. Rowling specifically stresses this; goblins aren’t just victims of discrimination, they “can look after themselves” and are known to do so so with violence. Anti-Semitic themes in European folklore do involve greediness and long noses, but not he kind of militancy ascribed to goblins in HP. Matt Zeitlin overlooks this in his quest to make the theory fit. In the fourth Star Wars movie there are stereotyped aliens based on Chinese, Jamaicans, South Pacific Islanders and Arab/Jewish merchants. That’s OK for a start and that is how people write. We have no examples of aliens so we borrow from what is alien to us and in this case “us” is middle class and well-to-do America. But to write well you have to change things, mix things, add some of your own life experience and if you do that well, on the screen the alien races will be different from anything that lives. As it was, we got Jar Jar Binks who was a negative stereotype. It think it is fair to make a parallel remark about the Goblins. As soon as I saw the bald headed, short, hook nosed bankers I thought, “Jew”. I didn’t think, J.K.Rowling or the producers of the movie were Jew haters but I thought the characters would have been better had they not so closely resembled a negative Jewish stereotype. I don’t know much about J.K.Rowling. She might hate Jews with a passion. She might be on the verge of receiving a Nobel Prize for her contribution to peace in the mideast. I am not about to judge her as a person. And, if a person really wants to find racism, bigotry and sexism he (or she!) will find it everywhere. But often what we are really seeing is something completely different. In this case I think we are seeing a bit of poor writing from an otherwise good writer. Do not assume that the goblins (or the wizards, for that matter) represent Jews. In Wales there are suppressed histories (Lhoyd 1584, Enderbie 1661, Sammes 1676) speaking of Chaldees in ancient Britain, and the early Christian monks of Iona were called Culdees. Granted, the name is religious rather than ethnic, but the religion came with an ethnic group that is associated with mitochondrial haplogroup W. It is associated also with wizards (viziers or seers). If you doubt that there was a wizardry in Europe – of magi, not sorcerers, and much maligned by the same type who hate Jews – take a look at the ‘wizard hats’ in Berlin dated circa 1100 BCE, which greatly resemble Hadramaut hats. Jews should know that prejudice against this physical type was rampant in Europe long before their arrival, and that it dated from widespread opposition to Germanic expansion south of the Baltic circa 200 BCE. The most virulent prejudice was directed against those who were integrated with Pukas, a very old ethnic group in Europe that has become ‘fictitious’ since the so-called witch hunts. Pukas were very short and had big ears. Be warned that if you do not keep fighting holocaust denial you’ll become ‘fictitious’, as those who have an embarrassing genocide habit will be happy to pretend you never existed. Often they adopt the names of groups they have exterminated, as a cover for their crimes. Pukas often integrated with Fane as well, the creators of the megaliths, light boned people with blond hair, also known as Danaans. They also integrated with giants (not Nephilim) a.k.a. Old Norse, who were regularly over seven feet tall, with red hair. The result was usually a stocky dwarf. Nine out of ten of the Old Norse were killed by Goths. These were the Old European types, associated with mitichondrial haplogroup I, who preceded the Basque migrations of the third millennium and the Indo-European migrations that followed. As it so happens, people carrying remnants of Puka features with a lot of Chaldee features are quite prominent in banking in Britain, so they’re a good choice for Gringotts. And if they aren’t always the friendliest of people (though some are) it’s because they are survivors. In Celtic countries, people with Old European features are generally self aware; in England ‘invisibility’ became the best way to hide, and the survivors of the witch hunts forgot who they were. Nowadays they resent the Celts’ impatience with them, because they don’t understand it; they think they’re Anglo Saxons, which of course they are – in part. The Celts want them to wake up. There is a big moral dilemma in this ‘invisible’ population, just as there is a conflict in the wizarding world of the Harry Potter books, because many survivors are under stress, enduring a lot of prejudice without being able to understand it or identify it as such. As things stand today, if you tell them that Old European types are real, your muckraking will be met with derision and ridicule worthy of anthropological study. In Europe there’s a lot of muck. OK, this was obvious to me the first time I saw a Harry Potter movie….the goblins are ugly, greedy little bankers with long, bent noses and beady little eyes…and small hands, of course. SO…yes this is definitely anti-semitic, portraying everyday Jewish life. Has anyone started a lawsuit yet? Could be some money in that! Can we at least acknowledge that Rowling does not actually say they have hooked noses at all? 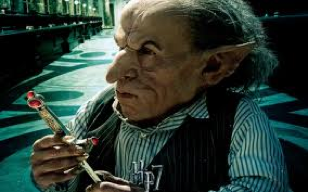 Griphook had a pointed nose, they were characterised by being short, having pointed ears and long fingers and feet, along with their skill in metal work and interest in treasure. They could be just as easily read as a blend between traditional dwarf and goblin characters, and the banking setting makes sense as a modern place for a dwarfish type of character to be. I realise that the movies have given the goblins a particular look, but lets not have a go at Rowling for Warner Brothers creative look and feel decisions. Not to mention of course the fact that Goblins, like all non wizard magical entities in the stories, are in the end vital to triumph over the ultimate evil and that their treatment by the wizard community is definitely not portrayed positively. One thing Rowling does well is to look at the nature of ingrained prejudice, often through the combined perspectives of Harry (the clueless outsider) and Hermione (the thoughtful outsider). Harry tends to take most of what people tell him as reasonable until he comes up against a reason not to, Hermione thinks about it first and in many ways is the moral barometer of the books. The perspective also widens as the characters age, with the relative innocence of the 11 year old, until the serious moral dilemmas and realisations of the serious problems and prejudices in the magical world in the later books. And I suppose the giant six-sided star set into the marble floor of the goblin bank is just unfortunate coincidence? Bull. I don’t know if Rowling harbors anti-Jewish sentiment (though enough Brits certainly do), but clearly someone who was responsible for the appearance of the movies chose to utilize ugly stereotypes about Jews to craft the goblin imagery. Actually, the star on the marble floor of the Goblin bank is in the exhibition hall of the High Commission of Australia building in London, where those scenes were shot. So yes, I think it’s an unfortunate coincidence. Those floors weren’t built for the film. They’ve been in the High Commission of Australia building, also known as Australia House, since they were built there between 1913 and 1918. I think the building was chosen for the film for space reasons, not to emphasize Jewish symbolism. Yet, I’ll agree that if the filmmakers weren’t so privileged, they might have had the foresight to alter or cover up the stars. But I don’t think it was an intentional choice just to be malicious. Actually the stars on the marble floors in Gringotts are the same as in the exhibition hall of the High Commission of Australia in London, where the Gringotts scenes were filmed. Also known as Australia House, the High Commission of Australia, London’s first permanent embassy, was built between 1913 and 1918. So yes, I think it’s an unfortunate coincidence that the stars on the floor of the Australia House correspond with Victorian goblin imagery to paint ignorant stereotypes about Jewish people. But I don’t think the filmmakers specifically chose to film in the Australia house to be malicious. I think they most likely chose it for space and the columns and chandeliers and other aspects of the hall. And the symbolism of the stars is an unfortunate, ignorant, and privileged oversight.